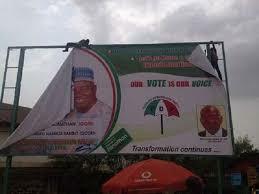 Governor Ahmed, Kwara Police Condemn Vandalization of Political Campaign Billboards – Royal Times of Nigeria. 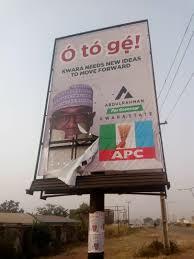 Kwara State Governor, Alhaji Abdulfatah Ahmed has condemned as unfortunate and unacceptable, the vandalization of billboards belonging to political parties and their candidates in the state by unknown persons. Governor Ahmed, in a statement issued by his Senior Special Assistant on Media and Communication, Dr Muyideen Akorede, denounced the action and warned political parties, their candidates and supporters to desist from such actions in the interest of peace and harmonious coexistence that Kwara State is renowned for. Ahmed urged politicians to campaign for votes in the forthcoming general elections on the basis of their ideas and plans for the electorate rather than deploying force, violent rhetoric or otherwise taking the law into their hands. The Governor said only the Advertising Practitioners Council of Nigeria (APCON) and the Kwara State Signage and Advertising Agency (KWASAA) are authorized by law to either approve or remove outdoor advertising for non-compliance with existing regulations. He, therefore, stressed that the Police and other law enforcement agencies in the state have been advised to arrest and prosecute anyone either violating the law on outdoor advertising or illegally destroying billboards. Meanwhile, the Kwara state police Command has also condemned the destruction of political billboards and has set in motion machineries to identify and apprehend the perpetrators of this dastardly acts to face the full wrath of the law. The Police Public Relations Officer, Dsp Okasanmi Ajayi in a statement issued today advised Parents/guardians sed to call their children/wards to order and warn them against being used by politicians.